Politico’s Roger Simon and Nick Shaper, the Executive Director of Digital Strategic Communications at U.S. Chamber of Commerce, are our guests this week. Roger Simon, a reporter’s reporter, has been making a lot of news lately. The chief political columnist for POLITICO, he recently sat with White House Chief of Staff Bill Daley and let his fellow Chicagoan riff aloud for 60 minutes with the digicorder picking up it all. Daley didn’t spare the expletives, or the candor, and when Simon’s stories appeared online, the headlines started humming. Simon’s been getting those kinds of scoops since 1975, when he started at the Chicago Sun Times. In the thirty five years since, he’s won a trophy case of awards through stints that included the Baltimore Sun, Bloomberg and U.S. News and World Report. 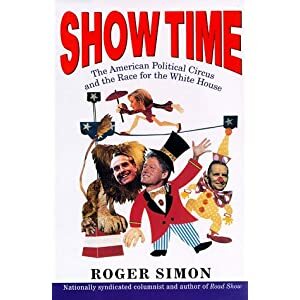 In between his weekly work, Simon’s been the author of four books – including one about me, sort of – SHOWTIME: The American Political Circus and the Race for the White House. After the publication of SHOWTIME, Simon joined the Chicago Tribune as White House correspondent, presumably to do longer “thought pieces” about the presidency during Bill Clinton’s second term. With the Lewinsky scandal breaking in January 1998, it didn’t turn out that way, and Roger’s description on our show of the pain of trying to report that story during that year is enough to cast a long shadow on the prospect of working full time trying to commit journalism from the White House Press Briefing Room. Roger’s current home, POLIITCO, has redefined, and keeps redefining, how politics is covered in America. So it’s at POLITICO that Simon, in one of Big Time Journalism’s great comeback stories, scored one of his earlier coups of current administration – an Oval Office interview the President Obama. We ask Roger to detail his own personal drama on the show. And that perch at POLITICO is also the beat from which he got Bill Daley to spill, at least some of, his guts. In the second segment of our broadcast, we get the download from Nick Schaper, Executive Director for Digital Strategic Communications at the U.S. Chamber of Commerce, on how organizations like the Chamber are using new communications technologies to enhance their advocacy efforts from Washington to well outside the Beltway.